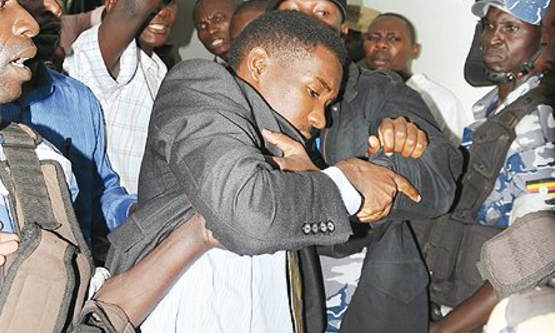 KAMPALA- Police have detained Bugiri Municipality MP, Asuman Basalirwa and Makindye West MP, Allan Ssewanyana as they headed to Entebbe airport to pick up Robert Kyagulanyi (aka Bobi Wine). Bobi Wine who just landed at Entebbe international airport aboard Kenya Airways has been arrested by Police after the force separated him from other passengers. Upon arrival at the airport men [five] identified themselves as security asked Bobi Wine to board a waiting van. He refuses and insists he will meet his lawyers first. Ssewanyana and Basalirwa also a lawyer to Bobi Wine were arrested at a checkpoint at Kitooro, close to the international airport. They are being held at a police post near the airport. Supporters of Bobi Wine may have been banned from the airport, but a big group of them have been spotted outside his home in Magere.